Chiropractic patients are more likely to avoid the need for surgery compared to patients under traditional care for back pain, according to a new study from the journal Spine. The results suggest that patients can benefit from pursuing conservative treatments for lumbar spine conditions prior to resorting to surgery. In the study, researchers sought to understand why certain back-pain patients are more likely to receive a lumbar-spine operation. To pinpoint which factors predicted the use of surgery, they analyzed the medical records of 1,885 patients with work-related back injuries in Washington state. Researchers discovered that the health-care provider played a significant role in whether a patient underwent surgery. For patients who first saw a physician for their back pain, 42.7% eventually ended up in the operation room. In contrast, just 1.5% of patients who first saw a chiropractor had surgery. 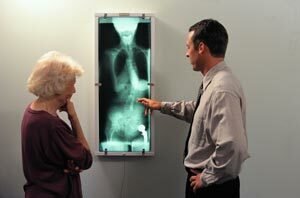 Nearly all of chiropractic patients were able to avoid lumbar-spine surgery through natural, conservative treatments. This adds to earlier studies suggesting that chiropractic can reduce your likelihood of surgery. In a 2010 clinical trial comparing microdiscectomy and spinal adjustments for sciatica, 60% of chiropractic patients had significant improvements without needing surgery. But chiropractors don’t just allow patients to avoid the risks of surgery, they can help reduce patient’s medical costs. In a new study published in the journal Medical Care, patients using alternative therapies like chiropractic had lower annual medical costs compared to patients under a physician’s care for neck and back pain. This research highlights how patients can avoid unnecessary medical procedures by seeking conservative, evidence-based treatments. Written by: Marissa Luck on February 7, 2013.Modified on March 12, 2013.